These are the few characters that appeared in the annuals and magazines. These are the few characters that appeared in the annuals and magazines. Most were one-shot characters that had little back-stories, but deserve some spotlight. Victor is a 4-4-0 tank engine who was scrapped a long time ago. He was originally brought to Sodor to help out with the construction, but after he was of no more use, he was scrapped. 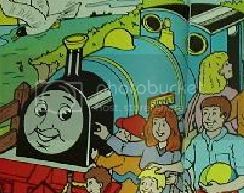 But years after, he was found and the Fat Controller restored him into a playground for the children's school. 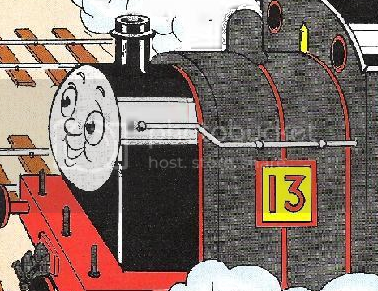 With no real name, 13 was known as a rather unlucky engine. He was a spare engine brought to help Donald and Douglas out. He had an open cab, and tended to get in the way of things. 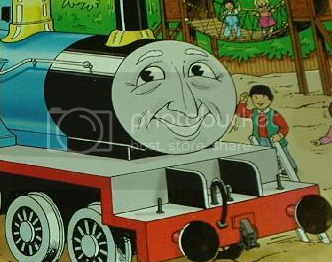 He caused delays for Donald and Douglas, got caught in a landslide, and damaged his firebox. The Fat Controller has his firebox mended, and that curied his jinx. He told the Scottish Twins he came to Sodor as an unlucky engine, but left a very lucky one. Sidney is a 0-4-2 narrow gauge engine that works the branchline on the Skarloey Railway. He has a bright attitude with paint to show it, and is good friends with Duck. Algy is a bright blue bus with a tough attitude. He was originally yellow, and was brought ot Sodor to help out during the summer overhaul. 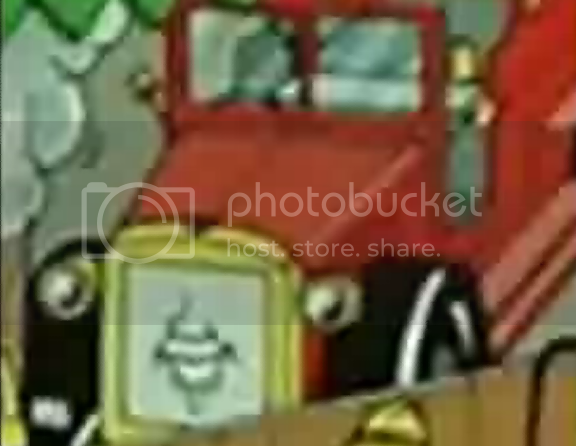 He teased Bertie, but after he broke down, Bertie collected his passengers and the two became friends. 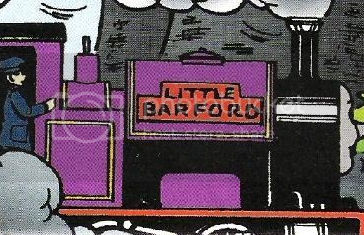 Little Barford is a little purple engine who works a factory route on the Skarloey Railway. Because of his name, when Percy told Gordon about him, Gordon thought the engine "small". But he recalls that he is indeed "midlle-sized". This truck took Scruffey's place after he was scrapped. 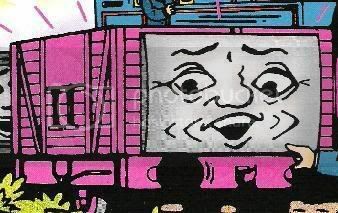 After hearing about Thomas's new paint, the trucks started complaining about being grey. The Fat Controller explained that the grey color hides all the grime and dirt the trucks gain whilst working. But this truck wouldn't stop complaining, so the Fat Controller decided to teach him a lesson by having him painted pink instead of grey, which the trucks laugh at him now for. He has been known as the Naughty Pink Truck ever since. Bennet And Co. is an old iron van that was once overloaded and fell into a river on a slight bend. Once he was rescued by a floating crane, the Fat Controller said he could have the rest of the day off. This bright vhicle is Angus. He is a restored fire engine that works the Sodor Fire Bridgade. He is sometimes full of himself, but knows when to be serious in a situation. Thomas is an stationary boiler tank on a farm beside Thomas's branchline. The farmer bought and named him as a joke to the engine Thomas when Thomas was bragging about being the island's most famous tank engine.